The first glance identifies the classical ideal: fascinating, beautiful. A portrait-love for statues might arise in front of this photograph, love for Athena from Velletri, a work of Alkamenes or Kresilas, the one in the Louvre. However the young women is both, she is this godess and she is not. 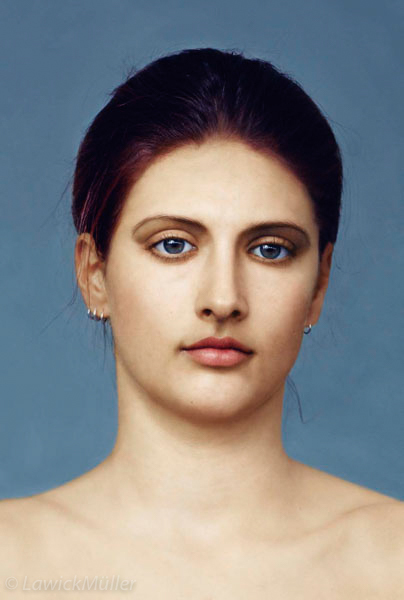 The model may have been changed only a little or perhaps there has been even more manipulation of her real face. In any case the result is perfection in its recognizable, timeless shape, faultless proportions of measures, viewless melancholia of a statue: today‘s girl as demi-godess. Admiration and confusion, a vague longing and a shudder at the manipulatory play are provoked by the digitally processed photographs of the artist duo Friederike van Lawick and Hans Müller. „Perfectly superNatural“ is the title of the series of morphed Greek divinities: Apollo, Athena and Aphrodite - each series with the same traits of the ever other Greek model implanted - are as well metaphors of the tyranny of the perfect ikon from ancient days as breathtaking probes of what could be made in a very close future..
perfectlySUPERnatural consists of 14 series altogether, each basing another Greek model of the Classical or Hellenistic period.